Maha-Mantra Week! September 5th to 15th ~ The Toronto Hare Krishna Temple! When His Divine Grace A.C. Bhaktivedanta Swami Srila Prabhupada stepped off the ship Jaladutta and arrived in Boston back in 1965, he bore just one desire in his heart: to share the impeccable glories of the Hare Krishna Maha-Mantra all over the world. Within a span of just over a decade, he established hundreds of temples and inspired thousands. Today, he is celebrated in over 400 ISKCON centres for sharing the imports of the pristine Vedic knowledge! 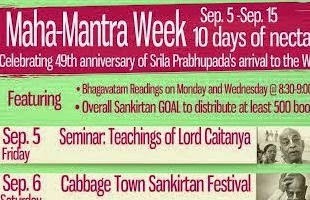 This year from Sep 5th-15th, ISKCON centres all over the world will commemorate the arrival of Srila Prabhupada to the West; here in Toronto, we have 10 days of various activities lined up for you. Also known as the 'World Holy Name Week', the intention of this festival is to appreciate and share what Prabhupada has given us and spread the (Holy) word! We encourage you to make the most of this by participating in multitude of ways; please read on for details. Readings from the Bhagavatam in great association that is sure to inspire and intrigue you. "Books are the basis". So help us bring them to others! 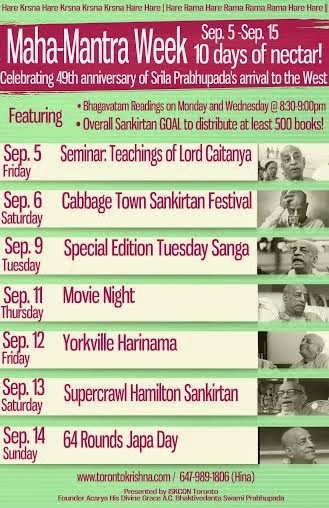 We have at least a couple of sankirtan events in the pipes; how many can you come for? Just show up! Simple enough? Are you up for the challenge? A presentation on the personality who actually gave us the Maha-mantra and traversed the planet only 5 centuries ago. Opportunity # 1 for taking up 'The 500 Distribution Challenge'. It will be a fun-filled outing with lots of kirtan, great memories and prasadam! This day marks the anniversary of Srila Prabhupada's accepting Sannayasa. Come in for a wonderful sanga to mark this event. An inspirational Thursday with viewing from "Following Srila Prabhupada" with butter popcorn and juice! Sway to Kirtan with pomp down the streets of Yorkville. Immerse yourself into the sublime depths of the Hare Krishna Maha-mantra in the association of others! It is going to be a busy 10, so will we see you all then?